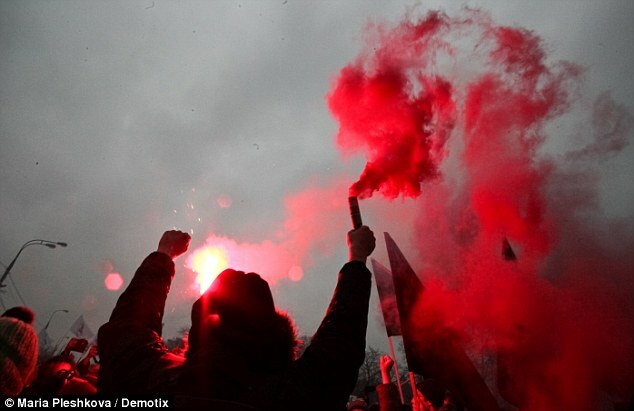 March 10, 2012: Activists take part in an anti-Putin rally in Moscow. Russia has the lowest rate of foreign investment in Eastern Europe and is held back by it's dependence on natural resource exports. It is estimated that corruption swallows between a third to a half of Russia's GDP. Both Putin and Dmitry Medvedev have failed to act on these issues and implement economic reforms. Will his declining popularity push him to act? Leave your comments below. This entry was posted in Pictures and tagged News, Politics, Protest, Russia. Bookmark the permalink.